Our core service is the system Integration Solutions for Energy Management Systems. We have provided EMS solutions to prestigious clients such as L&T, Tata Motors, Fiat Automotive, JSW Steel and Godrej being few of those. Our wired & wireless options help us cover every industrial as well as commercial installation into EMS network. Our EMS portfolio includes products for energy savings for lighting and motoring loads. We also provide EnMS System certification to ISO 50001-1 standard through third party certification agencies. Our Wired Energy Management System combines our Extensive Expertise in the design and Manufacturing of Energy Management, our deep understanding of what drives energy consumption and our Highly Advanced Intelligent Energy Management software to Deliver Real Energy Savings for our customers through a Range of services tailored to meet as per the customer requirements. The EMS Grid, as our system is know, has been proven to significantly reduce clients' overall energy consumption and carbon footprint and reduce energy costs by up to 15% to 30%. How many metering nodes are there? This helps us optimally decide node license cost. Are energy meters already installed? If yes, do these meters have RS 485 Communication port? Can you allow site visit prior to quote? WiEMS500 is an Energy Management System designed for WiFi networks. There is no communication wiring overhead in the entire configuration which involves installation of our GPF500 meters. The WiEMS can be installed on in plant server as well as our own Cloud server based on how clients see the convinience. 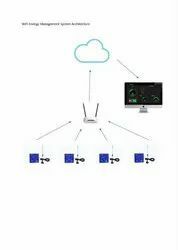 Our Cloud hosted energy management system is delivered as a combination of metering gateway connecting to 10 metering nodes or more. The number of nodes supported over each gateway depends upon the number of parameters being monitored, frequency of data logged over the RS 485 MODBUS network or overall on the communications overload on the line. Available with a starting price of Rs. 75000 for a 10 node, 1 block metering network, our Energy Management software provides a dashboard for Unitary Live, Group, SCADA Live, LCD View or even an aerial map of entire installation. Owing to integrated historian, we are the first EMS provider in India to provide minutewise parameter monitoring. Gateways are available for 10, 15, 20, 25, 30 & 35 nodes. Integrated Historian to provide minute wise parameter monitoring. Real Time status of meters, feeders, machines of entire plant in a single screen with live parameters. Energy Reports: 15/30/60 minute Energy Report, Daily, Monthly, Shiftwise, Feeder Comparison, EB/DG Report. Email / SMS Alerts for selected events programmable by client. Analytics: 1, 4, 8 Window analysis of different parameters of same feeder. The cloud hosted system costs covers annual maintenance & hosting support for first 3 years. From 4th year onwards, there is hosting & maintenance cost of Rs. 10000 per year per gateway. All software updates and analytics support is packaged in these recurring costs. How many energy meters do you intend to monitor? Are energy meters already installed? If yes, do those meters have MODBUS enabled RS 485 Communication port? Are you open for site survey before quote? If it is not possible for any reason, please provide location map of meters to help us calculate number of gateways needed. Conserve energy of lighting loads without heavy investments or cumbersome changes in light fittings. Krykard Lighting Energy Saver offers a simpler solution in Conserving Energy on all types of lighting including, old fittings with copper chokes, new fittings with electronic chokes, tube-lights, CFLs, etc. The LES is a device that saves energy by maintaining the power delivered to the lighting loads at an optimum voltage, without visibly compromising on the quality of lighting (Lumen output) or comfort. All types of lamps (except incandescent bulbs) have a non-linear curve for power consumption and lumen delivered. Depending on the type of lamp, about 20% lower wattage results in 5 to 10% lumen drop, which is not easily perceived by the naked eye. 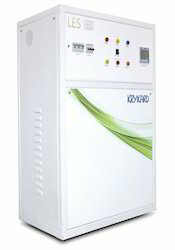 Appropriate power supply to lighting loads also results in improved power factor and reduced harmonics. 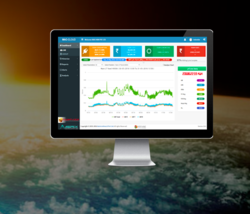 KRYKARD LES comes with a Load Manager to display kW kWh among other electrical parameters, to know the energy consumption patterns with or without LES, thereby instantaneously quantifying savings in energy.